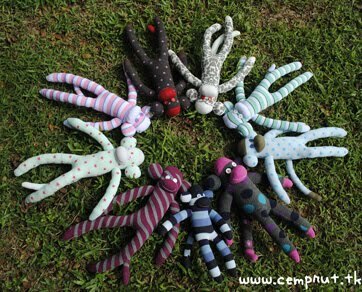 c e m p r u t: monkey sock doll attack...!!! 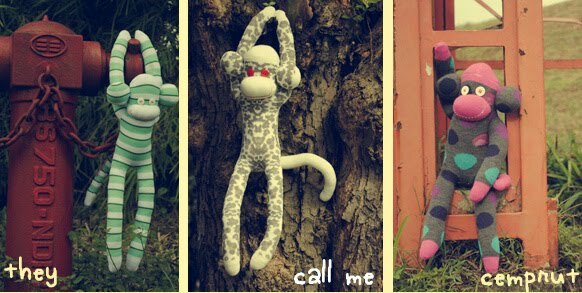 this is my fav photo, they (monkey sock doll) laying in a green grass holdin hand each other just like a brother monkey sock. and this is fun spot that we found in Banjar Wijaya Residence near my house. it's kind weird when some one build the telephone booth in an empty land surounded by high grass. 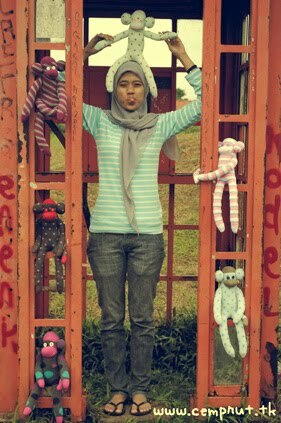 so if u wanna grab this cute monkey sock doll, just grab in my BLOG SHOP !!! or in my FACEBOOK !!! and let me yelling to ya: THANK'S GOD IT'S FRIDAAAAAAAY !!! i've been meaning to make one, got the pattern from internet and even the socks! tapi trus kok males yaaaah jadilah teronggok di pojokan aja hahahaha.. sini deh daku beli yang loreng2 piro?